This is a delectable hot, sweet, sour and salty pickle made from that most noble of vegetables, eggplant. This tender and delicious pickle from Maharastra is simultaneously hot sweet and sour. 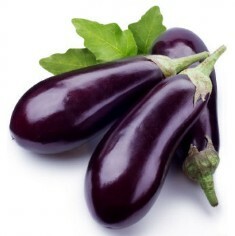 Select firm fresh eggplants for best results. Makes 3 cups. 2 teaspoons ground roasted cumin seeds. Wash and dry the eggplants. Cut them into wedges, ensuring each wedge has some skin on it. Heat the oil over moderate heat in a wok until fairly hot. Drop in the ginger and saute for 1 minute, or until aromatic. Sprinkle in the yellow asafetida powder, saute momentarily then add the eggplant, salt and cayenne. Stir-fry the eggplants constantly for about 10 minutes, or until the eggplants are soft enough to pierce with a knife. Add the vinegar or lemon juice, and the sugar. Reduce the heat and cook for another 10 minutes, or until the eggplants are very tender. Sprinkle in the ground cumin seeds, and remove the pickle from the heat. Allow to cool then serve.